Mike Linden: one time Tpr, 54 TR, later Cpl, King's Dragoon Guards, Palestine and Libya, now resident, for the last 60 years, in New Zealand. I was at Stainton from about Jul/August 1946 until January 1947 before going overseas. I registered for military service when I turned 18 in 1946. I was sent first to the Gordon Highlanders barracks just outside Aberdeen in June for basic training. I think the unit was called 20 Primary Training Wing. It was almost like being back in the school army cadet troop apart from the fact that they had you seven days a week and they were quite serious about training. We did the usual foot drill (sometimes to the accompaniment of a couple of pipers and a drummer), small arms weapon training, PT, route marches and so forth for six weeks under the benevolent eye of the Gordons’ instructors and then we were posted away for our corps training. This could have been infantry, engineers, artillery or whatever. I was told at Aberdeen when making the choice that if I wanted to go in the infantry I would be in line for a selection board leading ultimately to a commission. They must have been short in the infantry but I didn’t want to be a foot soldier. I asked for the armoured corps and I was posted to the 54th Training Regt, RAC, who had the Stainton and Streatlam camps at Barnard Castle with two squadrons in each. These camps were on opposite sides of the road (A688) a couple of miles east of Barnard Castle and their main gates were a couple of hundred yards apart. You could tell there were tanks around when you noticed the damaged stone walls alongside the road. Tanks can cause a bit of mayhem on icy roads. At Stainton Camp, where I was first posted, discipline was very much stricter than at Aberdeen. For the first three weeks we seemed to do nothing but foot drill all day. We spent hours and hours marching on the square each day at the mercy of a very large Irish drill sergeant. In the evenings we were allowed out of our huts for half an hour to visit the NAAFI to squander our pay on more food, usually eggs and chips and a cup of tea. Coffee seemed non-existent in the army. Our pay was 3/- (15p) a day but with deductions made for uniform allowance, barrack damages, etc we were generally paid 15/- (75p) or sometimes £1 each week. (We had a pay rise some months later to 4/- (20p) a day). In the evenings we had to spend our time smoothing out the brassware on our belts and other equipment so that everything had a glassy shine. Similarly, one pair of boots had to be worked on with a hot spoon, spit and polish and, as the days and nights wore on, some spectacular results were achieved. I got my boots looking like patent leather. We were allowed out of camp on Saturday nights as far as the camp cinema. After church parades on Sundays, it was back to polishing. 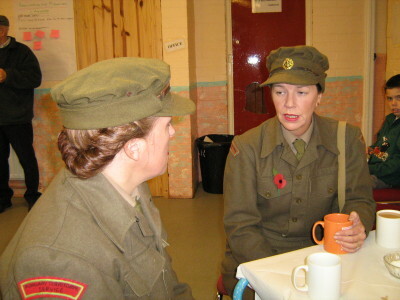 There was a big, humourless corporal, who wanted to become a sergeant, in charge of our hut to make sure we kept at it. Looking back at it now, I think they wanted to make sure we looked like soldiers when we were allowed out of camp for the first time after those three weeks that had seemed like a lifetime. We all got a week’s leave at home and on our return, life eased off just a little as we went into our technical training. There were about 35 in our squad and we spent about six months at Stainton learning to be a gunner/wireless operator, gunner/mechanic or a driver/mechanic. I was a gunner/op. This meant I had to learn to maintain and fire a .38 revolver, rifle, Bren gun, Besa 7.92mm heavy machine gun in the tank turret and the 77mm gun, used both as an anti-tank gun and an artillery piece. I became proficient in the use of Morse Code as part of the radio training. Tanks and armoured cars have an intercom system within each vehicle and the vehicles are linked to each other by radio. All radio talk had to be done in accord with the set procedures. Everyone learned to drive and how to carry out routine maintenance on vehicle engines. During the training we also spent a week learning how to operate as infantry, should the need arise. I remember, during the course of this week, we were dropped off in small parties a few miles from camp and got some map reading experience by finding our way back across country. At one point we came across a very large and impressive country house set amongst some woods. It looked overgrown and deserted, almost derelict, and it may have been Rokeby House, near Greta Bridge. It didn’t seem to have any road leading to it. One thing I recall is a small, narrow hump-backed bridge near Egglestone Abbey that we crossed once while on driving instruction from Stainton. I remember we had to stop. The driving instructor got out and paid 4d. toll somewhere. We went back to camp another way and thus saved 4d. I have since seen quite a number of toll gates on highways overseas but never one on such a small bridge on a quiet country road. If they still charge a toll there, they must have accumulated quite a sum by now. As part of our gunnery training we went up to a gunnery range in the hills at Warcop in Westmorland. I think it was for about 4/5 days. I know one day – the Saturday – we spent most of the day decorating the sergeants’ mess for their annual ball that night and the next day we had to clean the place up after them. So there wasn’t much time for gunnery and it was drizzling most of the time. Apart from firing the 77mm guns we had to shoot the Besas while the tank was on the move. Even though we were on a concrete road and the Comet provided a stable platform, some of the bullets were going into the ground about 20 yards from the tank while others went up into the air at about 45 degrees. So much for precision shooting. You could follow the path of the bullets by the trace at the back of every five or ten rounds and we enjoyed the spectacle of the bullets hitting rocks and ricocheting straight up. The 77mm shells also had a trace on them and I recall at least one round that carved a wide spiral path towards the target. Something was off centre. Back to Barnard Castle – I can still recall the way the orderly sergeant would come into our hut, and all the others no doubt, around 6am each day and rattle the steel poker around the steel coal bin and shout. It was enough to wake anyone from the deepest sleep. As the winter drew on, we had to make our way in the dark, and sometimes in the snow, to the ablution block and wash and shave in freezing cold water. Then go to the cookhouse in the dark where the cooks would pour a spoonful of melted butter into the middle of your two pieces of bread. It would freeze solid again by the time you got to a table, thus ruining the bread. Bacon and egg for breakfast, in those days, meant dried eggs and minced bacon being made into a flat pancake and your serving, or ration, was a piece measuring 3 inches x 2 inches x 3/16 of an inch. That, plus the two slices of bread, a bowl of lumpy porridge and a mug of funny tasting tea was your breakfast. Incidentally, the bacon and egg only happened on Thursdays – food rationing applied to both the civilian population and to the armed services. On other days we got something equally as filling. As young lads, still growing and getting plenty of exercise, we were always hungry and what little pay we got was spent in the NAAFI on plates of chips and buns. Beer consumption in the NAAFI and elsewhere was absolutely minimal - very few of the younger soldiers seemed to drink and food was more important. It seemed part of the overall army plan to make the soldiers spend all their surplus cash in the NAAFI so that they wouldn't have any money available to spend in the town. We trained on Comet tanks which were just too late to see service in WW2. (Later - I believe some were in Germany right at the end of the war.) Little did we know at the time that the armoured regiments to which we were going were changing from tanks to armoured cars. At that time, there were four RAC training regiments at Barnard Castle and Catterick and three of them trained on tanks. When we got to Palestine, we found that only two of the eight or nine regiments there had tanks, the rest had armoured cars. Our training finished around New Year 1947 and we were sent on embarkation leave prior to joining regiments overseas. Our squad was mainly English, but there was one man from Wales and about six each from Scotland and Ireland. The Irish were all regular soldiers, having left the farm back home, and they were fairly quiet and serious. The Scots, on the other hand, came mainly from the Glasgow area. They tended to be quite vocal and/or belligerent but it was noticeable that when the training was over, they all got themselves jobs at Barnard Castle rather than go overseas. In contrast the Irish all came with us. While at Stainton I met a chap who was a form behind me at school and in Benghazi with the KDGs I met another who was in my form for a couple of years, we often used to cycle home together after school. I didn't see much of him at Benghazi as he was in a different squadron. And some years ago, I resumed acquaintance with a Welshman who was in my tent (and troop) at Tiberias in Palestine. For about ten years we exchanged letters at Christmas until he died last year. So, apart from them, I've never met anyone I knew from my army days. Being out in the S Pacific didn't help, I suppose ! 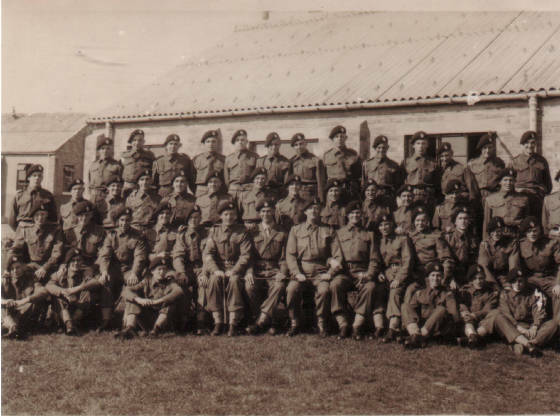 Here's a photo of my squad at Stainton in August 1946, taken just after we had finished our initial three weeks there. We were sent home for our first week's leave from the army that day. about ten weeks after we joined up, hence our happy faces. This is the only photo I have that was taken at Stainton. Looking at it now, I have no recollection of the bulk of the faces. I see in the middle are an SSM and a Lieutenant, both with RTR cap badges, and I think this was the only time we ever saw them. Alongside them are our large Irish drill sergeant and the room corporal. The man at the right hand end of those standing is an Irishman standing about 6' or 6' 1". Looking along that row you can see how undersized so many of the recruits were. I am sitting at the extreme right end of the second row, in front of that Irishman. Peter Mooring, a draughtsman from Middlesbrough. When we were shooting at the Warcop gunnery range, he got a finger caught in the breech of a tank's 77mm gun. He went off to hospital and we never saw him again. Bill Moodie, a van driver from Newcastle. He joined up with me at Aberdeen and we served together virtually to the end. However, when we boarded a lighter at Tobruk harbour, which took us out to a troopship standing out to sea, Bill was left on shore as his name wasn't on the list to go home. We were all going home for demob. I met him a year later in Newcastle and he told me that he had to do an extra six months in Libya while waiting for his lost records to be found by the Army HQ in the Canal Zone in Egypt. I can't remember his name but he didn't like the army and was always going AWOL. The Military Police knew where to find him and kept bringing him back. He had lost that much time he was starting his RAC training all over again by the time we left for the Middle East. The winter in1947 was one of the bad ones. On our return to Westwick Camp after embarkation leave a whole group of us got off the train at Broomielaw around 9pm on a still, cloudless and bright moonlit night. and found ourselves standing in a snow-covered farming landscape. The only thing breaking the surface of the snow was the network of dry stone walls that marked out the fields. Another inch or two of snow and these too would have been covered. In our greatcoats and with our kitbags over our shoulders we went cross country on top of the walls in single file, rather like sheep but in silence, and hoping that the man in front knew where he was going. I cannot remember anymore than that but obviously we got where we were going alright. Normally overseas drafts were on their way out of England within a few days of returning from embarkation leave. Because of the heavy snow, we spent two or three weeks at an embarkation camp near Barnard Castle waiting to go. One day we went on a snow clearing detail up the railway line from Barnard Castle, helping to dig a train out of a long deep cutting.. We found it virtually impossible, with long-handled shovels, to throw the snow up to the top of the cutting but we had to persist. A couple of days later, we had to dig the snow away from Barnard Castle station itself as it, too, was snowbound. Because of the snow, and our consequent inability to leave Barnard Castle, we missed getting on a troop ship at Southampton. I gather we had to wait for the next one which was due to leave from Liverpool. In the meantime, a party of about a dozen of us were sent to an empty camp, I think it was called Humbleton, where we maintained an anti-squatter guard. Apparently, in other parts of the country, homeless people were starting to move into deserted army camps and that was something the politicians didn't like. As it was, no one came anywhere near this camp for a week, apart from the truck that brought our three meals each day. It was like being on holiday - apart from the cold weather and snow. When we went back to the embarkation camp the snow started in earnest again. (This was probably Westwick camp. There were several nearly empty camps around Barnard Castle). We dressed in as much clothing as we could and slept almost fully clothed at nights. Nearly all the water pipes were frozen and it was almost impossible to wash. I remember one wash house had one tap over a basin that must have had a faulty washer and as the water kept dribbling out it didn't freeze. This tap had to serve those among the few hundred of us who may have felt the need to wash and shave. It was a most miserable time. The temperature was constantly below freezing; body warmth more than anything else heated the forty-man huts; there was nothing to do - although one morning we went on a route march to the other side of town and back, six or seven miles I suppose. The camp was only there to assemble a draft and put them on a train to the docks as soon as possible. It had no facilities to keep the troops occupied. (Westwick camp was really just a staging camp for 2 or 3 days usually for people from the 54th. But we had to put up with it for 3 or 4 weeks at least with very little fuel for the hut stove and we probably didn't have any money as I don't recall being paid there). No NAAFI canteen, no radio, no papers, no cinema, just huts and a cookhouse to serve three meals a day. Although we didn't know where we were going - no one ever tells you things like that - it was generally thought that our draft was going to the Middle East. Precisely where, we didn't know, but Palestine was a good bet. Eventually, one afternoon at the end of January, we got the word to fall in on the road outside the hut in the snow with our kitbags. As we started to get assembled, some of the more hot headed ones started throwing things at the hut. In no time flat, the hut was under bombardment from stones and rocks and anything that could be lifted. All the windows down that side were broken and I think the door was off its hinges. An RSM, who was with us, stood there and never said a word. It was the nearest thing to a riot that I'd been in. When the ammunition was exhausted, we formed up in threes, marched to the waiting trucks and got driven away to Barnard Castle station. It was quite an experience. I imagine the theory behind the non-intervention was that once the young lads had worked off their frustration towards that camp, everything would be alright. And so it proved. It was just as well there weren't any military police at that camp. I don't think they would have been sympathetic. I wrote this account of Stainton Camp as part of a personal history, which goes back to about 1931, which I wrote for the benefit of various nephews and nieces, my brothers and cousins. It was compiled by writing down notes periodically of what I remembered straight on to the computer. I found that the more I wrote, the more I remembered. After ten years or so of this, I put all the notes into order and printed them from the computer, had them copied and spiral bound and then circulated them individually around the family. I've led a somewhat unusual life. Born on Cheshire, moving south to Surrey with my parents and brothers when I was 4, going to school in Croydon, our house suffering a second lot of bomb damage (flying bombs in 1944 and a mine coming down by parachute in 1941), moving north to Northumberland where my mother had relatives, my father having died in E Africa fairly early in the war, to the army in Aberdeen then Barnard Castle, then to Egypt, Palestine and Cyrenaica (Libya}, back to UK 1948, emigrating to NZ in 1952 on transfer from the UK Civil Service to he NZ Public Service. Then transferring from Wellington, NZ to Nandi Airport, Fiji in 1954 (NZ administered the airport) initially for 2 years but I stayed on for seven. Then to the capital Suva on the other side of the main island, to work on an RNZAF flying boat base for four years until it closed down, with the Sunderland flying boats being replaced by land based aircraft in NZ. From there to Rarotonga (Cook Islands, a bit west of Tahiti) on secondment to their Treasury for two years, to sort out revenue collection problems for their government. Then back to Fiji (Nandi Airport again) for another five years on the administration of two major construction contracts. The first one was to extend the concrete paving around the terminal building so that jumbo jets backing away and turning from the terminal did not have their outer engines moving over grass and possibly sucking up stones.. The second was to enlarge the terminal building to four times its original size. All this with the airport being open 24 hrs a day. Eventually back to NZ in 1976 (I'd been with the NZ Ministry of Works for many years), happily married to a Fijian lady and we're still together after 40 or more years. I was then in Works Head Office for a year, initially to sort in out the final details of the two contracts I'd been involved with in Fiji and then in their Property branch, drafting letters for the Minister's signature in reply to complaints from the public regarding land acquisition matters. Finally, to the Taupo area where I spent my last twelve years before retiring. This time on a long term project on the investigation and development of geothermal energy and its potential for electricity generation. There are large pockets of extremely hot water a thousand or so feet underground in various parts of the North Island and we had a number of drilling rigs in action, tapping into them and assessing their potential, very much like drilling for oil but we were after hot water. I was looking after all administrative matters on the project - the list is endless - and we had a workforce that got up to 275 at times. Three large power stations (two of them geothermal) have been built in the Taupo area and their output adds quite a bit to the national grid. Since then came retirement to the shores of Lake Taupo, firstly playing a lot of golf until my knees started to give up (I'd played a lot of rugby in my younger days) and then developing an interest in genealogy. From then on and for many years I seemed to be physically attached to my keyboard, writing up notes. And that's my life in a nutshell, or rather, half a page. So now you know where the story comes from. And you can see that not all civil servants spend their time drinking cups of tea and passing bits of paper around ! I wrote these notes few years ago but I've never sent them to anyone. I know they have nothing to do with Stainton Camp but thought you might be interested in the kind of officers I came across while in the King's Dragoon Guards. The KDGs were part of the first standing army in England back in the 1680s and they probably looked down on junior cavalry regiments. I have tried to be strictly factual throughout and I have no axe to grind. The KDGs, or at least the officers, seemed more like members of a gentlemen's club. A good income seemed essential. While I was with them the CO was Lt Col WB Radford. I understand he became rich in his twenties when his father died and left him a sizeable piece of real estate in central London. I believe he was the CO of the R Gloucestershire Hussars when (my brother) Brian was with them in England and Austria 1945/47. My Squadron Leader (B Sqn) at Benghazi was Major the Lord Clifton, who became the 8th (or 10th) Earl Darnley a few years later when his father died. He had been a young Lieut. in the KDGs at the outbreak of WW2 and was sent over to France in 1940 to get some battle experience. In doing so, he was captured by the Germans and spent the rest of the war in a prison camp. His grandfather, or maybe great-uncle, was the Hon Ivo Bligh (later the 6th or 8th Earl Darnley) who was captain of the first MCC cricket team in Australia in 1883. Lord Clifton was the only officer during my service to stop me, off duty, and have a chat about life in general. My Troop Leader (3rd Troop) was Lt G le M Croll. I looked him up on the internet some time back. He had recently died and his full name was Graham le Mesurier Croll and was he buried in a country churchyard in Suffolk. The actor John le Mesurier, the long suffering sergeant in Dad's Army, used his mother's maiden name of le Mesurier as his stage name. He, too, is buried in a country churchyard in Suffolk. There could be a family connection. The Troop Leader, 4th Troop, was Lt David Brown, a son of the owner of the David Brown tractor and Aston Martin car empire. A rather arrogant man, he was known for his "Champagne for Breakfast" style of living and his forgetfulness in paying his bills. The Troop Leader, 5th Troop was Lt MB Noble. His Christian names, according to the internet, are Marc Brunel. He became Sir Marc Noble when his father died. Marc Izambard Brunel was a world-renowned engineer in the 1800s. Apart from roads and large bridges and so on, he built three of the first steel-clad trans-atlantic passenger liners. There could be some family connection. There was a definite connection with the Baden-Powell (boy scouts) family and this was possibly influential in him being the Commonwealth Commissioner of the Scout Movement. As such, he passed through Nandi Airport in Fiji in 1975 while I was there, on his way to a conference in Hong Kong, I think. I didn't go down to the terminal to greet him, however, as I was playing in a golf tournament on the airport at the time ! Support Troop Leader was Lt PM Boileau. His obituary a few years ago said he resigned his commission in the KDGs as he couldn't afford the social life ! He subsequently became Military Advisor to the Jordanian Govt, with the rank of Colonel. The Troop Leader, 1st Troop. was a Lt Anson and considering all the other officers around him, I wouldn't be surprised if he was a descendant of one of Lord Nelson's admirals. Polo was a popular sport among the officers and there was also a Hunt and a largish pack of hounds when we were in Benghazi. We used to think the horses and hounds got more attention than the men. Quite a few years ago in Taupo, I met an older man wearing a white t-shirt with a large illustration of the 13/18th Hussars cap badge on the front. I was in the 13/18th briefly in 1948 when the KDGs went back to UK, leaving behind about a dozen of us with still a little time to go before demob. Talking to him, he said, amongst other things, that when he was in France not long after D-Day he and some others from the 13/18th were transferred to a Royal Tank Regiment unit. When the RTR colonel addressed them on arrival, he said that they could forget all about their fancy cavalry ways, they were in a professional fighting unit now and don't you forget it ! The RTR seemed to be the blue-collar workers in the Royal Armoured Corps in those days. Maybe a bit short on airs and graces. Troop leader (3rd Troop. B Sqdn) was Lt Croll. We never saw much of him and I'm not sure how he filled in his day. He was a good swimmer. He won all the swimming and diving events he entered in a regtl swimming competition. But he rarely came with us on our map reading and gunnery expeditions. Troop Sgt was Bob Campbell, and I didn't see much of him either as he departed on LIAP soon after we got to Benghazi. LIAP stood for home Leave In Advance of PYTHON, after 18 months overseas service, and PYTHON was home leave after three years overseas service. There was a Cpl in the troop but he had more or less retired from army life as his demob number had come up and he was waiting to go home. There was a L/ Cpl who oddly enough wore 5th Dragoon Guards badges. I never knew why and he seemed to treat army life as a half-term break from Greyfriars with Billy Bunter & Co. I've just thought, he may have been Jewish and British army Jews never went to Palestine, where the 5DGs may have been stationed. Of the ORs.I remember Stan Hargreaves, a Dingo scout car driver, Roy Francis, who drove my Daimler armoured car, Ken Spence who drove the other armoured car and there must have been two or three others who's names and faces escape me. I remember on occasion I had to stand out in front of the troop on morning parade, in line with the troop leaders, and call out the numbers on parade and where the others were to the SSM. He seemed to add it all upon his head and relayed the numbers to the Sqn Ldr standing alongside him. And presumably to the Sqn office who would want to make sure no one was AWOL. A memory that has just come back. One night at 2am we had to leave our beds without warning and go on parade. Then the Adjutant arrived hatless and read out the Riot Act to us. I don't think any of us took it in, and most thought the Riot Act was a work of fiction, rather like the Wigan Pier. It must have been a quiet night in the Officer's Mess. And so to bed. In the Officer's Mess it was like moving into a different world. A Sgt was posted to the Mess at about the same time as me and he seemed rather uncomfortable about working at close quarters with the officers. His wife, however, enjoyed the life, and she tried to instill a bit of nouvelle cuisine into the German PW and Arab cooks and the young ACC cook from Yorkshire, 'Pip' Devine. Her most spectacular achievement was putting cochineal into the mashed potatoes and turning them blood red one 'Dining In' night. Caused at least a few raised eyebrows ! The junior ORs in the Mess were a Cpl Bob Martin who looked after the horses, polo ponies and pack of hounds. As we didn't see much of him, he may have slept in the stables or elsewhere. There was the CO's driver, a young Londoner who could be best described as a 'wide boy'. And there was a batman who had previously been a professional sparring partner and I think he had walked into one straight right too many. Another had recently come out of a 'glasshouse' somewhere for going AWOL. His three months sentence was added to his group number for demob. Another was picked up by the MPs in Benghazi after pinching a watch from a Arab jeweller's shop. Another batman was a nervous little man who had five or more of stripes upside down on his sleeve, denoting 15 or more years of undetected crime, as they say. Another was a small red faced Scotsman who had a whisky problem. Yet another who was waiting to go to Oxford Univ. And there were others whom I don't remember. Quite a bunch of misfits, but that's what National Service brought in. Luckily, I was able to operate completely outside the batman fraternity and was only responsible to the Mess President, Major Luck, the KDG 2 i/c. I kept the books neat and tidy and in balance and the Major was quite happy. He offered me a third stripe if I signed on and went back to UK with the regiment. But I declined with thanks, saying that I was on the permanent staff of the civil service and had a job to go back to. I would have much happier staying with 3rd Troop as a gunner/op (I enjoyed the gunnery part). But I was abruptly transferred to the Officer's Mess to look after their accounts. I had no accountancy experience or training but at least my name came off the guard list and I had a room of my own in the Mess. We were sorry to leave the KDGs and transfer to the 13/18th Hussars when they arrived. As we were only going to be with them for a matter of weeks, we didn't really fit in. However, as they were short of senior NCOs, I had to take my turn as orderly sgt for a week and as guard commander now and then. But soon it was all over and I said to myself, if they want me again they'll have to find me !